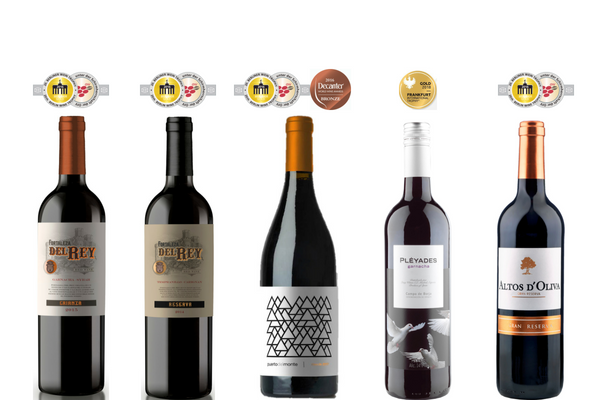 The world’s major international wine competitions have been trickling out their results this summer, and as always, Long Wines has picked up a good number of gold medals to add to those already awarded in April. One of our latest launches, the Puerto Del Monte Mencia 2017 from DO Bierzo picked up both a gold medal in the Berliner Wein Trophy 2018 and a bronze in the UK’s very prestigious Decanter World Wine Awards 2018. The quality of the wines we offer from DO Catalunya was proven with three further gold medals in the Berliner Wein Trophy 2018 going to wines from the region: Fortaleza del Rey Crianza 2015 – a great value oak-aged blend of Garnacha and Syrah–, Fortaleza del Rey Reserva 2014 and Altos D’Oliva Gran Reserva 2010. Another major German wine competition – the Frankfurt Wine Trophy 2018 – awarded a gold medal to Pleyades Garnacha 2017 from DO Campo de Borja. The results of Mundus Vini and Asia Wine Trophy are released in September, so we’re sure to be back with more good news soon!